Head out of the tangle of the city and go on a desert adventure with this evening safari from Abu Dhabi! With your professional, English speaking guide, you'll go on a 6-hour desert tour where you'll hop onto a 4x4 vehicle and head off road, straight to the highest dunes. As this happens in the evening, you'll avoid the hottest parts of the day and enjoy the desert in all its glory. 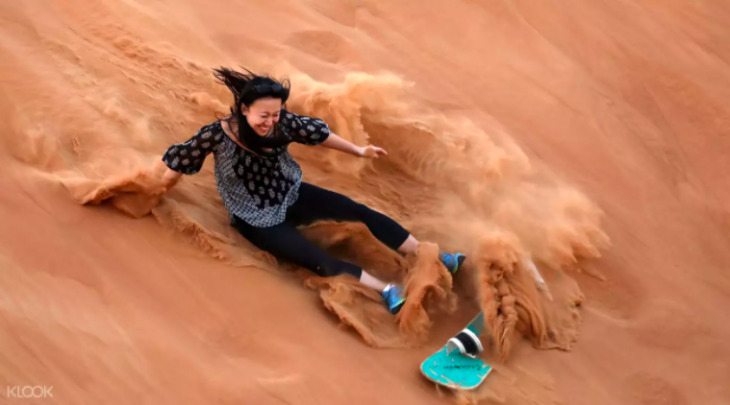 While you explore the vast rolling hills of golden sand, you'll be able to grab a board and go sandboarding down the slopes of the highest dunes! See the marvels of the Arabian Desert and get the chance to do cultural experiences such as getting henna paintings on your skin and riding a camel. Here you'll also taste delicious traditional Arabic coffee and try some sweets as you sit at a Bedouin encampment covered in Arabian carpets. Here, you'll enjoy a delicious barbecued dinner as you soak up the magical desert environment. You can even take photos of yourself in Arabian dress and capture the splendor of the desert sunset. You'll be able to watch traditional Tanura dancers and alluring belly dancers as you sit and enjoy these magical evening moments. It's an amazing experience you shouldn't miss! Tackle the highest dunes of the Arabian desert and enjoy the magic of desert cultureon this evening safari! A professional English speaking Safari guide will aid you on your adventure!